Sensational acrobatics – upside-down spins, one-armed balance acts, and head pirouettes (yes, you read that right) – are what awaits the event-goer who dares to explore unconventional art and experience a majestic hybrid of street performance cavorting with formal dance – found in the internationally acclaimed dance troupe Compagnie Kafig. The Compagnie Kafig company was first organized in 1996, and since then, it has taken the world by storm. Founded by French Choreographer Mourad Merzouki, this world dance fusion collective has toured extensively – throughout Europe, North and South America, Africa, and Asia. Merzouki himself has a rags-to-riches tale to his life and career. He and seven siblings grew up in a working-class suburb of the southern city of Lyon, France. At the age of seven, he was practicing martial and circus arts, but it wasn't until eight years later that he discovered hip-hop for the first time – and through this, he discovered dance. Deciding to develop this form of street art by way of hip-hop while exploring other chorographical styles, the young Merzouki went on to create relationships with other dancers, starting with his first company, Accrorap. But it wasn't until he decided that he needed to develop his own personal artistic style that Compagnie Kafig came to be – and through this, he developed a group of contemporary hip-hop-based dancers who have been described as having "animal energy," "street-savvy instincts," and "theatrical intelligence." But what's in a name anyway? Especially a name as distinct as Compagnie Kafig. The word 'kafig' refers to a cage, and Merzouki used the word as the title of the first piece he made in 1996 – and in this case,'kafig' equals liberation, as he wanted his art to flatten any barriers between spectator and performer. Thus, the "Company of Liberation" – or, "Compagnie Kafig" – was born. "Jamie [Grady, Director of the Mercyhurst Institute for Arts and Culture] saw them at Jacob's Pillow Dance Festival," explains Christine Olivier, assistant to the director at MIAC. "And he was overly impressed with the fusion of styles the group brought – combining modern movement, set to classical and world music." Jacob's Pillow is a dance center, school, and performance space located in Becket, Mass., in the Berkshires, and is known to be the oldest internationally acclaimed summer dance festival in the United States. "We were really lucky to get them. They also performed at the Spoleto Festival [a festival held for 17 days and nights in Charleston, S.C.] – and you know if this group is performing for these two festivals, then they're doing something right," she adds. Now the group is coming to Erie for the first time in between performances in Fayetteville, Ariz. and Pittsburgh, bringing the eleven members of the company – all in their teens and early twenties – who hail from Rio de Janeiro and have generally trained themselves, without all formal study, exploring their own individual art. Without being boxed into musical stereotypes, the group has managed to create a their own inimitable style that has not denied its origins of Latin dance but has found a way to win over audiences whose own background is as diverse – having performed for those from the South Bronx to Los Angeles and internationally – like the dancers themselves. 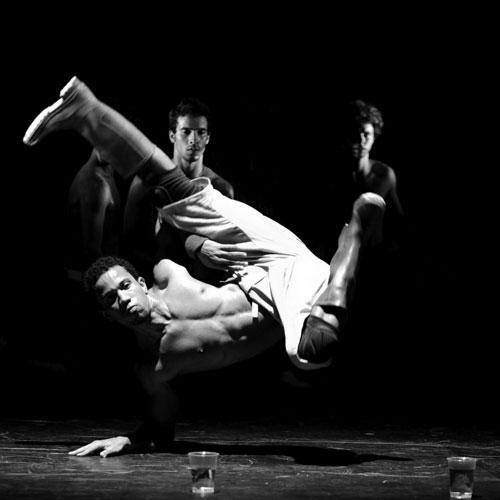 Diego Alves Dos Santos – a dancer currently with the company, and who explains that his English is "a little rough" – took the time during his travels to convey the energy and passion he had for his art, and explain how he first even got involved in dance. "I was nine years old. Our school in Brazil had a dance center, and it interested me," he says. "I asked my parents if I could get involved, and at first, my family didn't like it – my father specifically felt that dance was meant for women. But I insisted." I quickly learned part of his drive was to prove that dance should break down those barriers and that he wanted to assure others that men should be able to make a career out of it as well. "Part of my desire was to prove others wrong who felt that women should only be involved," he explains. "But I also loved it. I learned a variety of dance forms – from hip-hop to Latin to breakdancing." Diego ultimately received training in urban dance at the school of Marcia Lacombe and earned a diploma from the UniverCidade in Rio de Janeiro. Diego had been performing with a different company and working with several renowned dancers when he was introduced to Merzouki. "In 2006, I went to France to perform, and I met him while on tour," he says. "He liked our performance so much, he proposed to do one with us." And so it began. Diego started to work with Merzouki in 2008 touring throughout Asia, Europe, the United States, and Japan. "Before the tour, we would practice six to eight hours a day – and that was as a group. I would also spend two to three hours myself working on my own skills. Now, as we are currently on tour, we spend about three to four hours practicing a day." And he embraces the performance life. "I love to travel. I only get back to Brazil every once in a while, but the world is so exciting," he adds. "When I was young, I was able to see everything online and in books, but it's not the same. Today, I get the opportunity to meet famous directors and choreographers and explore other cities and countries. I love it." As for whether Diego hopes to continue performing over the years? "This is my career – I hope to dance until the last days of my life." Diego has been part of the group since its inception and helped to create the current performance that will be brought to the stage in Erie – a collective work titled "Correria Agwa." "Correria Agwa" are two words that set the tone of the division of the performance into two distinct parts. "Correria" means "running" in Portuguese and consists of jerky, hectic movements, while "agwa," meaning "water," focuses on dances that are more fluid. The piece incorporates water, a reminder of the vital natural resource that it is - and to showcase a symbol of renewal. "Agwa requires us to provide 1,500 plastic cups," Christine explains of the upcoming performance. "Literally, it was part of the contract." In my past life, I have had the opportunity to work with artists and their contracts, and some have made interesting demands – a $1,000 dollar bottle of cognac, an additional piano to be used as a "back-up," and so on. Given my experience, while still interesting and perhaps unconventional, this request seems like a piece of cake. To get a better sense of what Christine was explaining, though, I watched a video of the performance – which was, simply put, stunning. The cups are neatly placed in vertical strips across the stage, and are then manipulated in many ways; the dancers pour water from one cup to the next, and they join empty cups together to become one long plastic snake, while one dancer does back flips across the stage, never disturbing the cups. The piece marries dance, acrobatics, and props, creating a stunning trio that offers a combination of athletic samba, hip-hop, and capoeira dance styles. The other piece, "Correria," attempts to capture the flow of daily life. The tone of the piece is loose and easy – not as scripted and defined as "Agwa," with all of those cups, as the men run from position to position, showing off their prowess as dancers in solos, duets, trios, and more. The piece is intended to portray the frenetic pace of life – something we are all too familiar with. "They have really young energy, and we're excited to bring them in. They bring diversity, youth, and power to the stage. It's going to be a great family show," Christine tells me in closing. And event-goers will want to get there early. "Normally the box office opens an hour before the performance. We wanted to set the tone for the event so we decided to showcase one of our own students – Alan Abremek, known as DJ ONYRC." Abremek self-produces dubstep music, which he will perform in the Cummings Gallery (adjacent to the theater) for the hour leading up to the performance starting at 7 p.m.
All told, this company is equally at home on college campuses as it is at the prestigious Spoleto Festival. Compagnie Kafig's young Brazilians' virtuosity shines through their combination of hip-hop, samba, electronic music, and bossa-nova performances and is sure to resonate and inspire any patron who has the opportunity to experience their raw energy. The troupe will perform two highly entertaining pieces, Agwa and Correria, on Wednesday, Jan. 29, at 8 p.m. in the Mary D'Angelo Performing Arts Center. Tickets are $27 and $30 for adults; $24 and $27 for seniors; and $18 and $21 for students. For tickets, call the box office at 814.824.3000 or visit miac.mercyhurst.edu.